BULGARIE – Sliven - Archaeologists discovered a rich Thracian grave from the 1st century AD in a mound in the municipality Sliven in south-eastern Bulgaria. The findings provide evidence for the preservation of burial rites and a strong Thracian aristocracy in the Roman era. 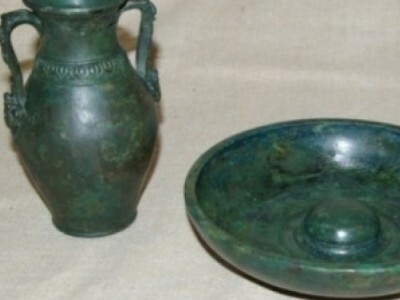 The main finding is a 15 cm long bronze amphora, with two uniquely decorated handles. Another valuable discovery is a bronze skillet-shaped patera. One of its side handles ends with a lion's head, while the other ends with an animal combining features of the lion and the goat. Both items served ritual purposes. The archeologists also unearthed a bronze coin, the origin of which has not yet been dated. The experts have already managed to restore two of the artifacts found, archeologist Diana Dimitrova informs. According to her, the other objects found in the grave, such as bronze pushpins, a clay balsamarium and glass containers are proof that this is a tomb of a rich aristocrat. TURQUIE – Bodrum - During excavations carried out by the Bodrum Underwater Archaeology Museum in the Aegean town of Bodrum’s Ortakent district, graves from the Mycenaean era have been unearthed. 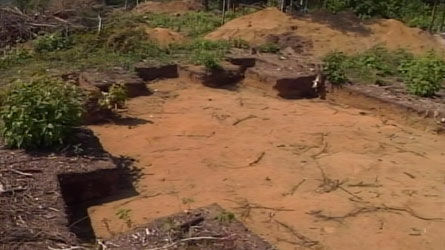 According to a written statement issued by the Culture and Tourism Ministry, pieces unearthed in the graves are very important for the scientific world. Among the pieces are baked earth, water bottles, cups with three handles, a carafe, a razor, animal bones and lots of glass and beads of various sizes. 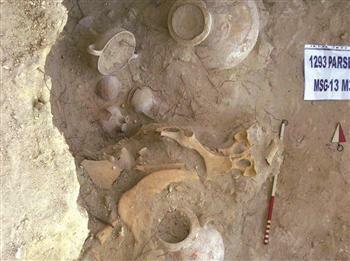 Examinations on nearly 3,500-year-old artifacts show that the graves date back to the Mycenaean III era around 600 B.C. to 1,000 B.C years ago. The two graves are important to understand the cultural and artistic relations between ancient Anatolian people, the statement said. ROYAUME UNI – Massingham - The Gaywood Valley Archaeological and Historical Project has carried out a number of digs at different sites across the valley. Run by the West Norfolk and King’s Lynn Archeological Society, the project has unearthed a Germanic token, at Great Massingham, which demonstrates the areas Hanseatic links. The Nuremberg jeton is dated between 1586 and 1635 and would have been used as a counter for a merchant to keep count of his stock. 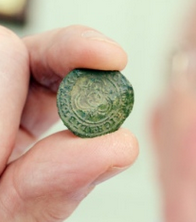 Project director Dr Clive Bond believes this coin shows the extent of King’s Lynn’s reach as a trading port. “The jeton demonstrates the Hanseatic connections of the Gaywood river community,” said Dr Bond. “It demonstrates that a counting device was used at a fair in the area, it is not coinage. There would have been fairs at Great Massingham from medieval times. “The rivers were an important transport route to the area and the river Nar was a route into the heart of Norfolk.” The copper alloy jeton is believed to have belonged to German merchant Hans Krauwinckel. King’s Lynn’s port was a source of goods such as wax, fish and tar from Hanseatic towns and the finding shows the extent of the port’s reach. AUSTRALIE – Dampier Archipelago - High resolution images produced by oil and gas companies exploring the Pilbara could reveal Aboriginal artefacts from thousands of years ago. University of WA researcher Dr Ingrid Ward believes rock art and other Aboriginal artefacts could be submerged below sea level about 20 metres off the coast in the Dampier Archipelago. Dr Ward says she hopes industry will help fund a university study of the images. "What we're trying to do is do a very disciplined investigation," she said. "So rather than just looking for a needle in a haystack, actually use our technology to look in very targeted ways at specific areas and specific sites for types of archaeology but also just to understand the landscape and get a picture of what the landscape used to look like." TURQUIE – Side - The southern province of Antalya’s district Side will soon welcome a new open-air museum when centuries-old temples in the area are restored as part of ongoing archaeological works. 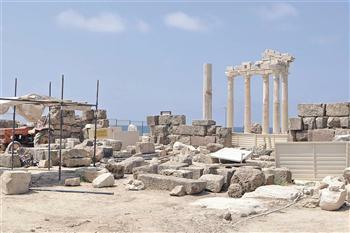 “When the 1,800-year-old Apollo and Athena temples in Side and the 1,300-year-old Basilica Church in the same area are restored and revived, the region will have a new open-air museum, a new attraction place for tourism,” said Professor Hüseyin Alanyalı, a member of Anadolu University’s Archaeology Department and the head of the excavations. He said works were continuing on the eastern gate of the ancient city and in the area of temples, adding that excavations and restorations could take two years in the latter. CANADA – Longue-Rive - La construction de la route de contournement de Longue-Rive a permis de découvrir des milliers d'artefacts datant de plus de trois mille ans. Il s'agirait d'un campement amérindien occupé au fil du temps. Les fouilles se sont déroulées en juin dernier. D'ailleurs, ont peut encore apercevoir sur les lieux les traces laissées par les archéologues. Il faut savoir que pour tout nouveau tracé de route, comme c'est le cas à Longue-Rive, le ministère des Transports doit réaliser une étude de potentiel archéologique. Sur le site, les archéologues ont découvert entre quatre-vingts et cent mille éclats de pierre et entre huit cents et mille outils ou fragments d'outils. Cela représente un site considérable selon les experts. Les artefacts seront donc analysés de manière plus approfondie. Cette découverte archéologique n'a pas d'impact sur les travaux de la route de contournement de Longue-Rive, donc le chantier devrait être achevé à la fin de 2014 comme prévu. OMAN - Wilayat of Abri - A national team completed in the last two seasons a number of excavations in the Wilayat of Abri, Halban in the Wilayat of Barka and Saih Al Makarim in the Wilayat of Sohar. The team found archaeological artefacts, while digging the foundations for the construction of a new building. The site is a cemetery dating back to Iron Age. ROYAUME UNI – Arbeia Roman Fort - A gold and silversmith’s workshop has been found outside the Arbeia Roman Fort, along with several rare finds, including a whistle. 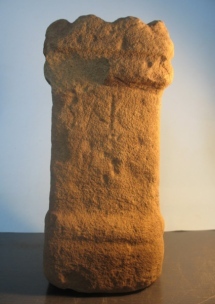 The finds were made by people taking part in WallQuest, a community archaeology project led by Tyne and Wear Archives and Museums and supported by the Heritage Lottery Fund, which aims to find out more about the 30 miles of Hadrian’s Wall between South Shields and Hexham. Dr Nick Hodgson, project manager, said: “Volunteers carrying out excavations at Arbeia Roman Fort in South Shields revealed the collapsed remains of the fort’s defensive wall, plus a gold and silversmith’s workshop and several exciting Roman artefacts.” The artefacts include a whistle made from animal bone and a portable stone altar, inscribed with the word ‘sacrum’, meaning sacred to an unknown god. BULGARIE - Kozi Gramadi . 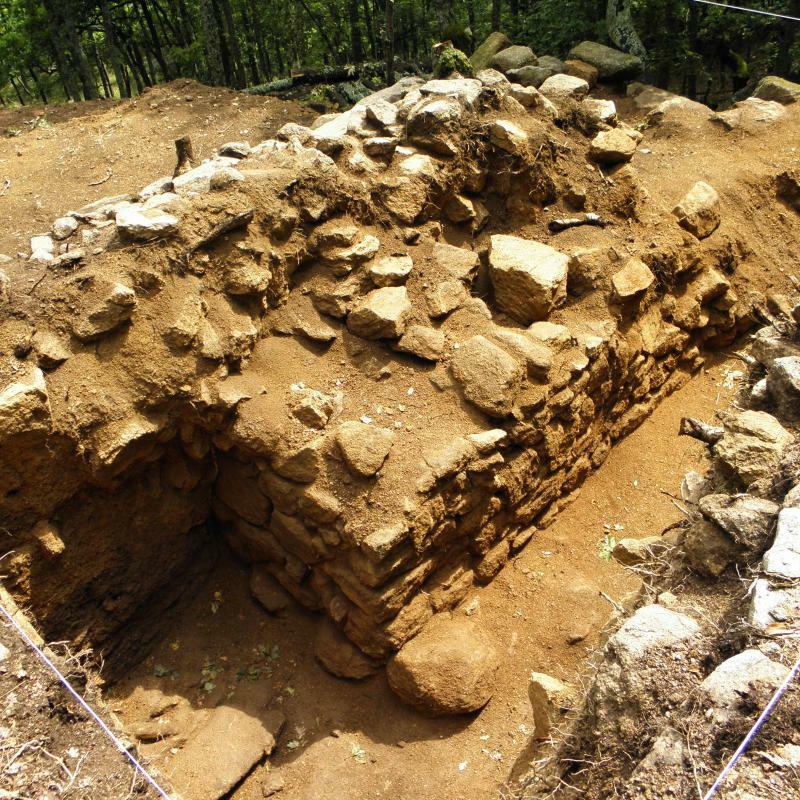 Archaeological team of Dr Ivan Hristov discovered a big votive relief of the ancient Father of Gods and men Zeus close to the archaeological excavations of Bulgaria’s National Museum of History at the Kozi Gramadi peak in Severna Gora, close to the village of Starosel. Director of the National Museum of History, Dr Bozhidar Dimitrov, announced the news for FOCUS News Agency. “It is bigger than the votive slabs found so far and probably it is the central icon of the ancient temple,” Dimitrov said. A strange event took archaeologists by surprise while the votive relief was taken out. A big imperial eagle started flying over them. In antiquity Zeus was often portrayed as an imperial eagle and the younger women archaeologists started commenting that Zeus had come to see what they were doing in his temple. The Kozi Gramadi stronghold, built in VI-V century before Christ, was a capital of a Thracian tribe, which used to live in this part of Bulgaria during the antiquity. The popular tombs close to Starosel are in fact the necropolis of the Thracian aristocrats living in the city.